I just watched an amazing film that touches on a lot of the stuff I deal with on this blog and in my ministry. 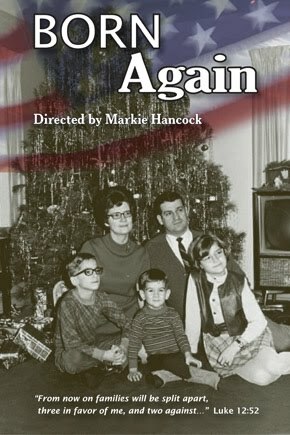 It is a documentary about the life of Markie Hancock, called Born Again. She was raised in an evangelical household and embraced the religion of her parents. Born in central Pennsylvania, Markie Hancock was indoctrinated as a child to be a born-again Evangelical Christian. Although a fervent believer into her early twenties, Hancock began to experience some dissonance and doubt. BORN AGAIN chronicles Markie Hancock's slow and painful break with her faith and her family as she experiences sexual discovery and explores the larger world. Upon returning home from several years in Berlin she recognizes that the split with her family is irreconcilable unless she returns to the faith and no longer lives her life as a lesbian. Through this personal exploration we see a divided family, a divided nation, and a divided self who, despite the odds, emerges whole. The film is about much more than being gay. It is about the psychological hold that religious conviction has on our families and our nation. Her family does not demonstrate a mean-spiritedness toward her. Her interviews are quite touching. It is just that the chasm of religious conviction is impassable. The film concludes that religion is divisive and negative. She is "born again" but not into the fundamentalist faith of her childhood. She is born again into an acceptance of herself and her relationship with her partner and her new family. The film left me thinking about a number of things. I respect her choice to leave religion. I am all for it. It was toxic. Yet I keep wanting to say to Markie, "Not all religion is like that." Yet her story is not mine. Religion was far more toxic and divisive for her than me. I wonder if I am deceiving myself and if what I am coming to embrace is nothing like religion at all. I certainly am more like her than her parents or younger brother, Nathan. However, I still think of myself as having a religious sensibility. It raised important questions for me. Perhaps you too. My colleagues in ministry may find a point of connection. She attended Princeton Seminary for a year as part of her "rebellion" against her parents as Princeton is supposedly "liberal." This is an important film and one I may show to college students at ETSU. You can watch it now on your computer. Powerful video, thanks for the link. I just cannot understand how you can reject your child. Don't you just get tired of the "I love you but..." statements. I have been dealing with a couple of friends who are trying to shed their evangelical damage. They don't learn healthy boundaries, particularly between men and women. Wow, really dysfunctional. What IS it about Wheaton College?!?!?!?! I cannot tell you how many friends I have who have gone there. A number of them have been gay, and Wheaton scarred them in permanent and damaging ways. "For Christ and His Kingdom," indeed. Feh. Princeton isn't liberal. It and other mainline seminaries are confused. On the one hand they teach critical thinking and analytical study of scripture. On the other hand they promote belief in the supernatural. Someday maybe they will figure out that you can't have it both ways. There is "mystery" but is it divine?